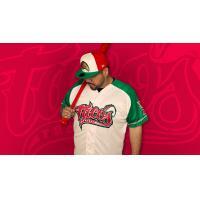 FRESNO, Calif. - A week after putting individual-game tickets on sale, the Fresno Grizzlies have revealed more details of their 2019 promotional schedule, and have unveiled the 2019 uniforms for the "Fresno Tacos," the team's Tuesday home game alter-ego. 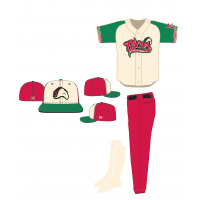 The Fresno Tacos, first introduced at the annual Taco Truck Throwdown event in 2015, and on the field for each "Taco Tuesday" home game since 2016, have played in a different uniform design each season. For 2019, the Tacos' look will more resemble the new Grizzlies' on-field look, as the club re-branded to a new scarlet, black and cream color scheme in January. While the Kelly green in the Fresno Tacos' uniform remains, the orange and yellow has been swapped out for red and cream (images attached). The Tacos cap and jersey logos remain unchanged in design, despite the new colors. The Fresno Tacos will take the field nine times in 2019: April 16, April 30, May 14, May 28, June 18, June 25, July 23, August 13 and August 27. "Our brand refresh being thorough and complete is very important to us as we launch this new era of Fresno Grizzlies baseball, but of course we know how important the Fresno Tacos are to our fans, and our overall Central California brand as well," said team president Derek Franks. "We're really proud of the phenomenon Fresno Tacos has become - we expect to continue to ship merchandise to all 50 states and several countries - so to have the new Tacos look overlap with our new primary look was the next logical step as we keep things fresh on the field, and for fans repping our gear." Fresno Tacos New Era 59/50 on-field caps and replica jerseys will be available for purchase in the Fresno Grizzlies Team Store shortly- but are available for pre-order now at FresnoGrizzlies.com. Monday Madness, presented by The Fresno Bee: Two Reserved tickets, two hot dogs, two sodas and two Fresno Chaffee Zoo vouchers available in one package, all for just $25! Dos Equis, Dos Tacos Thursdays: Fans 21-and-over who purchase a Dos Equis 24-oz can will receive two FREE taco vouchers during any Thursday home game. Thursday Happy Hour Special: The Happy Hour special from gates open to first pitch on Thursdays includes a burger, fries and a 12-oz beer (or soda), for just FIVE DOLLARS for the combo. The most affordable meal-deal in baseball! Friday Night Fireworks/Farm Grown Fridays: Post-game fireworks will continue to follow every Friday home game in 2019, and the farmer's market on the concourse pre-game and during the game returns for this season as well. Save Mart Sundays: Bring your Save Mart receipt or show the "Save Smart" app at the ticket office to receive $5 off each ticket (limit eight tickets). Two Grizzlies will sign autographs pre-game, and kids run the bases postgame after every Sunday matinee. Family catch on the field will also be pre-game on Sundays, beginning on June 16.